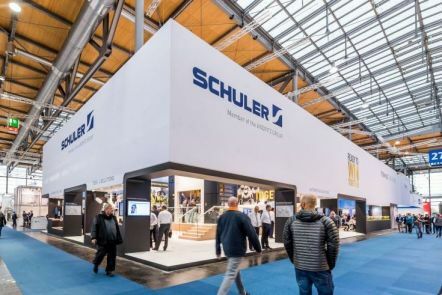 This year’s motto was “Ready to Win Together”, because with Schuler as a partner our customers can only win. The main emphasis was on Industry 4.0 with all its possibilities for forming technology – called “Smart Press Shop” at Schuler. The key exhibit at Schuler’s EuroBLECH stand was the new MSP 400 servo press. The control of the machine has been designed in the style of an intuitive smartphone app: operators can select from predefined movement profiles or program them freely. The “Smart Assist” software guides the operator step-by-step through the setup process, supported by small videos and text modules. The process monitor integrated in the control unit offers extensive monitoring options. The integration of additional sensors, e.g. for acceleration, oscillation or pressure – enables comprehensive condition monitoring of the system, which can be displayed in the control system’s visualization. EuroBLECH visitors were also able to catch a glimpse of the new virtual operator training system from Schuler’s Forming Academy. It is used to provide operators with basic training in how to handle the real forming systems in the press shop. This takes place in the virtual room at the same time as commissioning a new system or while production is ongoing. This ensures that production in the press shop is not disturbed and the operators can be optimally prepared. To monitor the condition of individual components for changes, wear, or damage (a feature referred to as condition monitoring), Schuler is integrating more and more sensors into its machines, such as those which measure vibrations and temperature, for example, so that this data can be intelligently processed and displayed. Currently, a large-scale field test is in progress in Göppingen involving a 1 600-ton hydraulic die hardening press, which produces parts for lightweight automotive construction from sheet metal heated to 930 °C. A live feed from the Hot Stamping TechCenter was shown at this year’s Schuler exhibit. Schuler has also already demonstrated its ability to fully network different production facilities, e.g. with its systems for manufacturing train wheels. Among other things, this process requires the availability of data necessary for determining and increasing the overall equipment effectiveness (OEE). The data is prepared by the system so that a quick glance is all it takes for the production manager to determine the total number of parts produced, how many of these parts are acceptable, and which shift had the best performance. The collected data also serve as a basis for functions like the tracking & tracing of safety-related parts. Among other things, the system links these parts to information about the starting material used and the material’s origin, about the system’s lubrication and drawing force, and about other production conditions. All of this makes it possible to provide a complete trail of documentation in the event of quality-related complaints. Electromobility was another focus of the exhibition. Backed by its subsidiary AWEBA, Schuler has the distinction of being the world’s only supplier of presses and automation as well as dies used to manufacture electric motors. Schuler’s high-speed presses are already being used by several well-known automotive manufacturers and suppliers in the production of electric motors. The new Smartline EV 3.8 is also capable of punching more complex electrical steel for higher energy efficiency. In addition, the range also includes systems for the economical series production of body and structural parts or metal housings for batteries. Press release: "Smart Press Shop Live"
Press release: "A new dimension of efficiency"
Press Release: "Ready for e-Mobility"